Hello, friends. Hope you are having a wonderful spring. We have unstable weather these days, with plenty of spring showers, clouds, sunshine, and wind. It’s a whirlwind. But, all in all, I still love it better than winter. Spring is my favorite season! Nature is waking up, the temperatures are mostly pleasant, trees and flowers are blooming, and there is finally fresh in-season produce available! The first of the strawberries, check. Foraged dandelion greens and wild garlic, check. My mom even supplied us with the first of the over-winter salad greens! 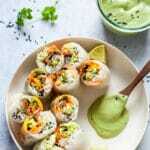 With the change of season, it’s also time to change the menu a bit, ditch the heavy stews and bring in the light vegetable soups, salads and, oh, why not, these Vegan Fresh Sushi Spring Rolls. These Vegan Fresh Sushi Spring Rolls are Vietnamese fresh spring rolls with a secret ingredient – nori algae! It’s the nori algae that make these spring rolls taste a bit of sea and sushi, but not overwhelmingly so. We also paired them with sushi rice with rice vinegar dressing. Also, this cute and vibrant hybrid is packed full of vegetables, making it a healthy lunch, that you can even pack to go for an office meal. Just beware to store with some moisture, like a damp paper towel, as the rice paper tends to dry out and become more chewy with time. 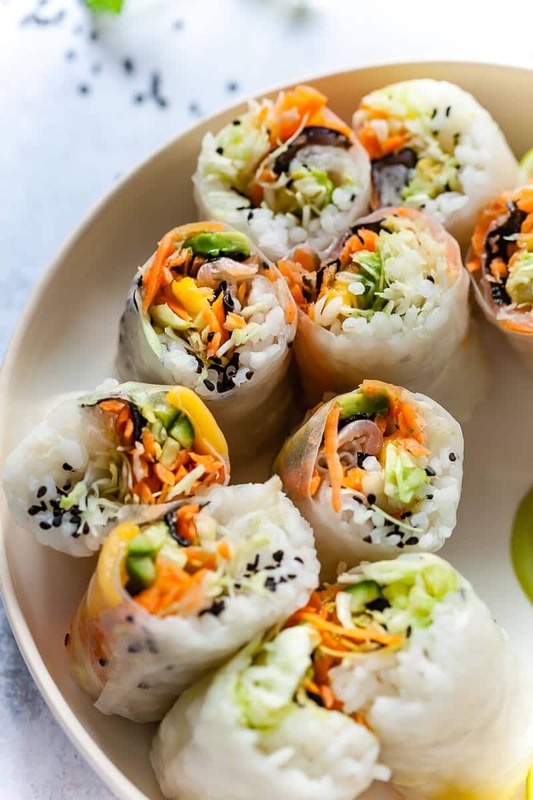 We recommend serving and eating these Vegan Fresh Sushi Spring Rolls as soon as possible! 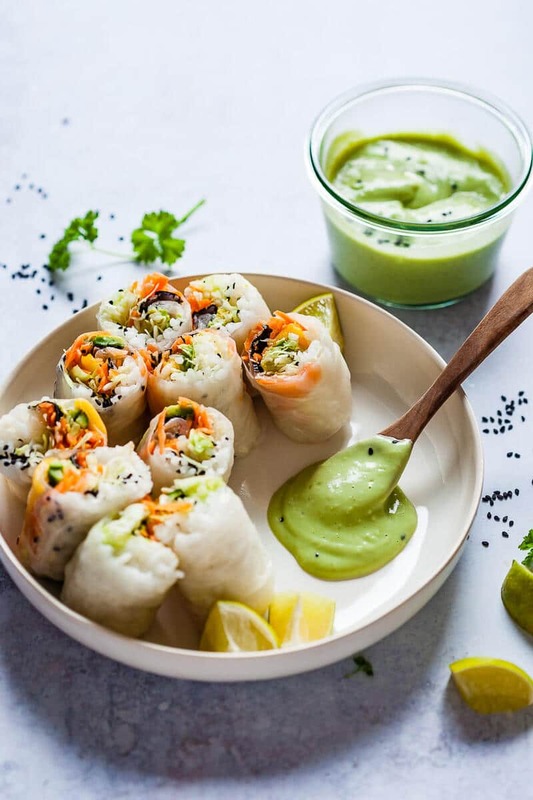 Oh, we almost forgot to mention the delicious dipping sauce we paired these spring rolls with! All that magic green sauce? 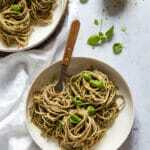 A delicious and easy Avocado Dipping Sauce with natural coconut yogurt made in the food processor in just a minute. It’s so good, you’ll want to have it as your next salad dressing, too. Prepare sushi rice: cook rice according to package instructions. Bring to a boil and then simmer on low for 10 minutes. Remove from heat and let rest for 15 minutes with lid on. Prepare the rice dressing: mix 2 tbsp rice vinegar with 1/2 tsp salt and 1/2 tsp sugar. Heat on the stove for the ingredients to dissolve and mix into the cooked rice. Let cool down. Prepare the avocado dipping sauce: Cut avocado in half, remove pit and scoop out the avocado flesh. 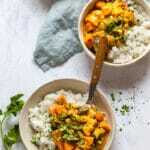 Place into a food processor, add coconut yogurt, soy milk, finely chopped garlic, juice of half a lemon and season with salt and pepper to taste. Blend until smooth. 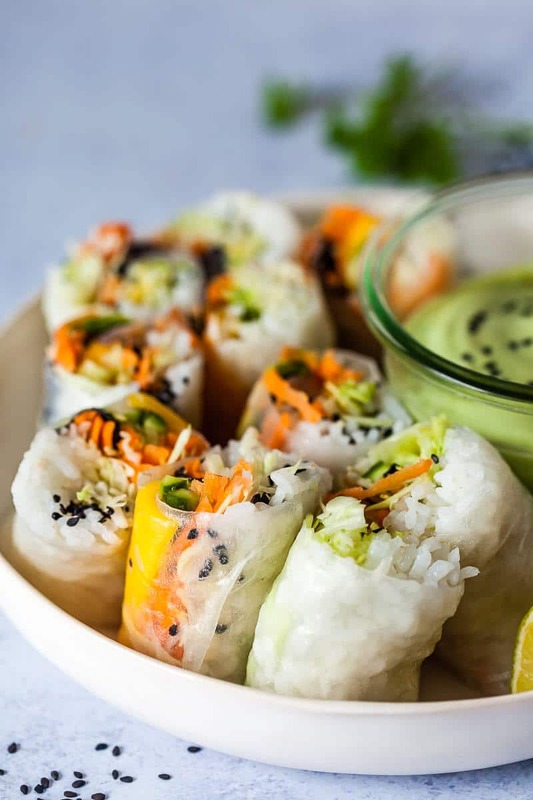 Prepare the spring rolls fillings: cut vegetables and mango into thin strips. Cut the nori algae sheet with scissors into strips, about 4 inches long. 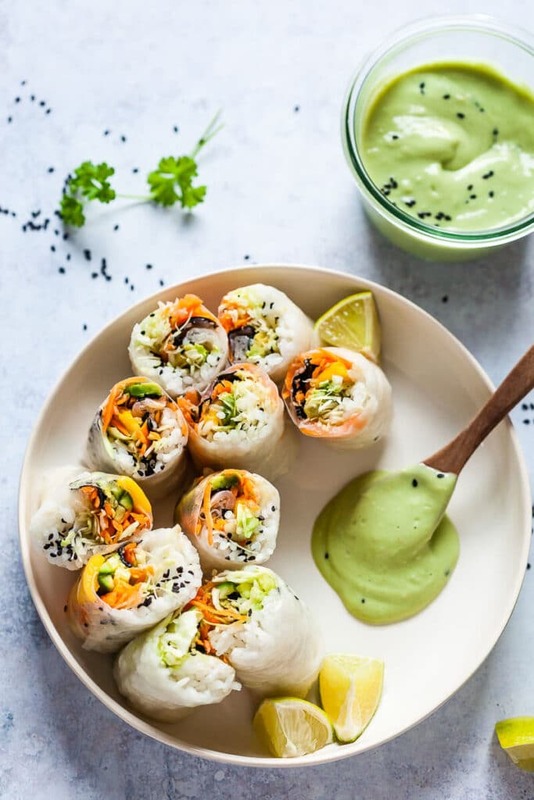 Assemble your sushi spring rolls: Dip rice paper sheet by sheet into a dish with warm water for about 15 seconds, until you feel the paper to become soft. Remove from the water and place on a clean kitchen towel. Start adding your fillings by placing a scoop of cooked rice and spreading it onto the bottom half of the rice paper. Make sure to leave about an inch of room to each side. 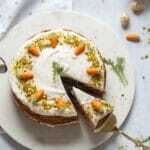 Add vegetables - cabbage, carrot, avocado, cucumber and mango. Then add a strip or two of nori algae and sprinkle with black sesame seeds. Roll your sushi spring roll: take the bottom (the one closest to you) and stretch it up over the filling. Do the same with the left and right side of the paper - pick up and stretch over the filling sideways. Be careful not to crumple the rice paper. Then, roll it away from you until your spring roll is formed and the rice paper sticks together, keeping the shape. 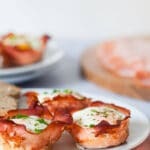 With a sharp knife, cut the roll in half and set aside on a plate. Store any leftover avocado dipping sauce in an airtight container for up to one day and use as a salad dressing! 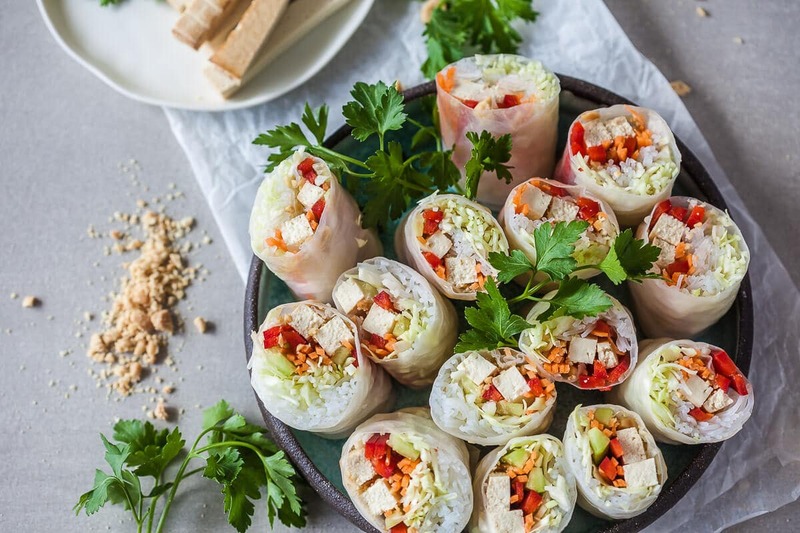 Try also our Vegan Tofu Spring Rolls!